In the five year since this story first ran, Mary Corliss and I have continued as annual members of the Times Square confetti dispersal battalion. One of our dear friends has retired, and another passed away, but new members from across the country swell Treb Heining's ranks. Grand strolls among the revelers are now verboten; we remain stalwartly at our posts, swapping stories and playing Scrabble until a half hour before the big ball drops. What hasn't changed is our delight at being part of the world's biggest, briefest and most cheerful winter carnival. Happy New Year, everyone! R.C. On the midnight stroke at your New Year's Eve party, between champagne swigs and kisses, you might have glanced at the TV image of Times Square: a million people celebrating in a neon-illuminated swirl of confetti, as if God had sent a pretty blizzard right on cue. But She had nothing to do with it. I did. Somebody has to drop the 7,000 pounds of varicolored tissue and motley Mylar. It's done by a crew of about 110 volunteers perched on roofs and setbacks of seven buildings from 43rd to 48th Streets. They work under the guidance of confetti master Treb Heining, the Newport Beach, Calif., balloonatic whose company, Treb, Inc., is the go-to outfit for balloon effusions at the Republican National Conventions. 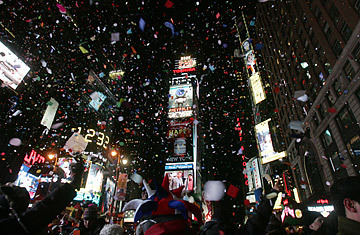 Since 1991 Treb has coordinated the confetti fete for the Times Square Alliance, the business association in charge of the big show. Mary Corliss and I joined the corps of Confetti Dispersal Engineers on New Year's Eve, as we had once before, on the so-called millennium of 1999-2000. We joined our chers amis Davie Lerner, Giacomo Ghiozzi, Victor Nelson and Gilbert Ireland, all CDEs of many consecutive years' standing. None of us had to blow up the 20,000 balloons due to be given out to the crowd; that task went to other people with more capacious lung power ... no, actually they use pumps. But we were on duty for nearly eight hours, as the elves in Father Time's workshop. We convened at 5 p.m. in the building at 1 Times Square (which is actually a triangle) for Treb's roll call, indoctrination and pep talk. As a member of this covenant I'm sworn to secrecy on matters of timing and mechanics  the technique, for example, for avoiding the dread occupational hazard of "confetti arm." But I am permitted to quote a few of Treb's dicta. Confetti dispersal, he intones, "is a physical, violent act," a therapeutic exercise that will purge, Treb says, "all your aggressions from 2006." (He knows us so well.) We are to remove wristwatches, bracelets, rings, necklaces and other gewgaws that might slip off during our pitching exertions. Treb also expects us to apply ourselves with the ascetic, aesthetic devotion of Trappist monks: "We do not do drugs nor alcohol, we do confetti." As in any military operation, the regiment is broken into squads, each commanded by a captain in radio contact with Gen. Treb. Under the captain, Treb says, "You will be instructed in how to fluff confetti," which isn't quite as salacious as it sounds. With a final invocation he sends us  mostly New Yorkers, but including recruits from California and Georgia  to our battle stations. We'd be there until after midnight, when we'd fulfilled our final mission: confetti accompli. Manhattan first celebrated the new year's arrival in Times Square in 1907  with a 78,000-pound iron and wood ball  and except for two years during World War II, has done so every year since, though the ornament has lost a lot of weight, svelting down to a 150-lb. aluminum ball in 1955. In the old days the thing dropped through the efforts of six burly workmen and a guy with a stopwatch. Now it's all done by computer. The crowd has changed too, in size, tone and demographic. On New Year's Eve 40 years ago, in my Columbia U. days, I came out of a 42nd Street movie theater, noticed that it was a few minutes after midnight and was able to call my mother on a pay phone just around the corner from the revelers, who probably numbered in the low hundred-thousands. These days you'd need to be the mayor, or Christina Aguilera (who sang last night), to be in that spot. The crosstown streets are barricaded from late afternoon, and to get a good spot you need to arrive by about 3 p.m. and be prepared to stay in one of the block-long pens that contain the crowd. Hold your water, too: some of the local eateries charge between $5 and $20 for pee breaks. Treb used to work in Special Events (party designing) at Disney theme parks, and the Times Square Alliance has learned a lot about crowd control from the Mouse House. Since an attraction at the Magic Kingdom typically entails standing in line for a half hour or more before four minutes of the ride, Disney keeps the customers from getting too restless and ornery with a "pre-show" of filmed or live infotainment. For Times Square visitors, the "ride" on New Year's Eve is about the same length  the shouting, singing and hugging at midnight  but it's preceded by eight or more hours of standing in the cold in one of those pens. So the pre-show comprises live and taped music acts and, at the top of each hour from 7 p.m. on, a countdown to zero second and a feed from whatever region (London, England; Ponta Verde, Brazil) is celebrating its midnight moment. That's when Treb's troops would fling into action, unfurling, say, the Mylar strips that blanketed the sky with what looked like glitter done by ILM. Some freelancers, stationed in the few Times Square high-rises with openable windows, unfurled toilet-paper streamers  two-ply contrails that, caressed by wind currents in the concrete canyon, glided and twirled through the night air for minutes on end. Every hour or so, I went from my station in the Renaissance Hotel on 47th Street to walk among the masses. The police officers acted the role of genial Joes and Janes, whose main functions were to snap pictures of tourists on request and to say, at a hundred checkpoints, "You can't go there." But we, the CDEs, could go almost anywhere. A flash of our red plastic badges with the magic word CONFETTI, and sawhorses magically parted, as if we had backstage and dressing room passes at a Springsteen concert. It was a class society, and we were among the elite. As we strolled through restricted areas, the crowd a few feet away waved their sausage balloons imploringly at us. To indulge them, I engaged in a brief but vigorous Stephen-Colbert-as-Tek-Jansen light-saber duel with one or two of them. It seemed they were having a splendid time. Why? How to explain the eager docility with which the revelers accept their status? Like the Broadway theatergoers (mostly out-of-towners) who form orderly queues instead of pushing to get inside first, they acknowledge the social importance of good behavior; it's the price they're willing to pay to be entertained. And they take to their roles with the same unquestioning good nature as college fans at the Homecoming game. It was a boon to everyone's mood that we had October football weather on Dec. 31: clear, with no wind or rain, and the temperature near 50. A beautiful night for an outdoor party. And, really, the onlookers are the stars. At the final countdown to midnight, we CDEs festooneed them with confetti. The words to "Auld Lang Syne" flashed on one of the JumboTron screens for a million-person singalong. Cameras sent pictures of good cheer and warm passion around the globe. To be in this group, even 28 stories above them on the Renaissance roof, was to show people in 1100 other countries that tough old New York could radiate an exhilarating warmth of community. So listen, world: we launched 2007 beautifully. Try not to screw it up.